Posted in: Home / Locations / France / Paris / Oh Paris how I love you! I immediately fell in love with Paris and could imagine myself living there- I couldn’t ask to have studied French in a better city! All of the marvelous sites surrounding you – the Eiffel Tower and Arc de Triomphe so close to school, the world famous Louvre museum and Notre Dame nearby, and such an energetic and cosmopolitan atmosphere… who wouldn’t want to live in Paris? Whether walking down the remarkable avenue Champs Elysses to window shop through all of the top fashion stores, or relaxing underneath the beautiful Paris night sky at the Palais de Chaillot, on the right bank of the Seine river, watching the Eiffel Tower and the glistening city landscape, I had an amazing time in Paris! Of course while in Paris you have to see the Eiffel Tower up close. I went at night, to see Tower at its most majestic as it glistens with 20,000 lights! The Trocadéro fountains are illuminated in front of the Tower, creating a fabulous addition – I took some awesome photographs! I definitely suggest climbing up the Eiffel Tower to get a fantastic view of Paris at night. You surely won’t regret it – seeing a city lit up at night is one of my favorite things, it looks so pretty and you get a wonderful overwhelming sense of the grandeur of Paris! 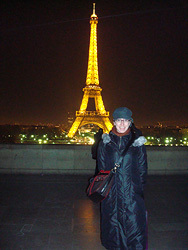 I was so pleased to have chosen Paris as my study abroad location. My school was in an AWESOME location – within walking distance of the Champs Elysées and Eiffel Tower – and just off the Place Victor Hugo, which also has great cafés to catch a coffee and croissant before your morning classes :). Wandering through the heart of Paris every day, through the amazing sites and fantastically beautiful buildings, yet doing ordinary things, like grabbing breakfast or a snack and chatting to my new friends in French really made me feel like a true Parisian! I also had great opportunities to take advantage to some of the not-so-typically-Parisian but very fun stuff… like visiting Disneyland Paris, and trying out French cookery classes – I discovered I’m definitely no gourmet chef but I had a great time! I loved every minute of my stay in Paris. Whether I was taking in the great culture, finding out about the amazing history, enjoying the yummy food, or just meeting people from all over the world and practicing my French, everything was new and exciting to me – the whole time I was there I felt like I was in a dream. I simply can’t wait to return! Hi Jessica! It sounds like you had a great time in Paris. I have never been there, but I am definitely considering it after reading how your experience was! Did you happen to try any food at the restaurant at the Eiffel Tower? A course in Paris is fantastic! I´m thinking about going a second time because it was so wonderful!